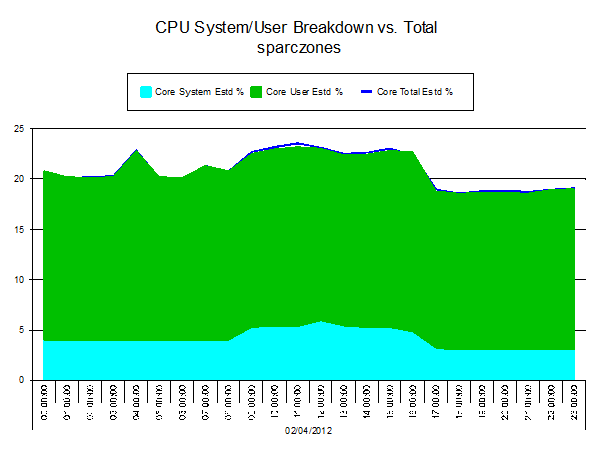 Below is an athene ® example chart displaying the kind of CPU Usage breakdown (System + User = Total) reporting you should be doing for your systems. What is the breakdown? Is user CPU higher? Should it be? If it’s not what is happening on the system to generate such greater CPU usage? 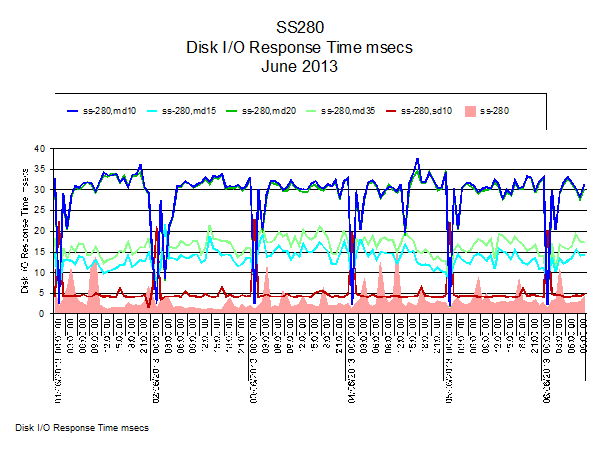 Another example report is shown below, this time showing I/O response times on UNIX/Linux disks. This example is from a SUN Fire 280. But because of the large numbers of disks, we will want to filter on a Top N (5) basis to identify the key disks which could be experiencing performance problems. The remainder of the disks are then aggregated as shown in Pink. This in effect produces a cumulative picture of disk performance. I'll leave you with a summary of my series. UNIX/Linux systems - are a well-established part of any data center, hosting applications and database alike. UNIX and Linux virtualization - is commonplace within organizations providing the flexibility to host many virtual machines and also to underpin Cloud Computing services such as IaaS, PaaS and SaaS. Monitor and analyze the data - but be aware of what it is telling you. If it doesn’t add up then it doesn’t add up. Have you got the right packages installed, e.g. sysstat? Linux popularity is ever increasing - GUI driven, a similar model to Windows, supported on x86 virtualization, gone from SMBs to multi-national organizations and installed on supercomputers. Also found on a range of hardware from mobile/cell phones to aircraft entertainment systems. UNIX/Linux systems support Big Data implementations - by using HDFS (Hadoop) software and its Map/Reduce functionality. Many individual systems with local block storage storing the data via Map and reported on via Reduce. Understand the technology – we need to have a good understanding of the technology to be able to perform effective Capacity Management. Identify what you need to monitor and analyze - get the business information, and predict future usage. For more on Unix and Linux Capacity Management join our webinar this Wednesday 27th April.